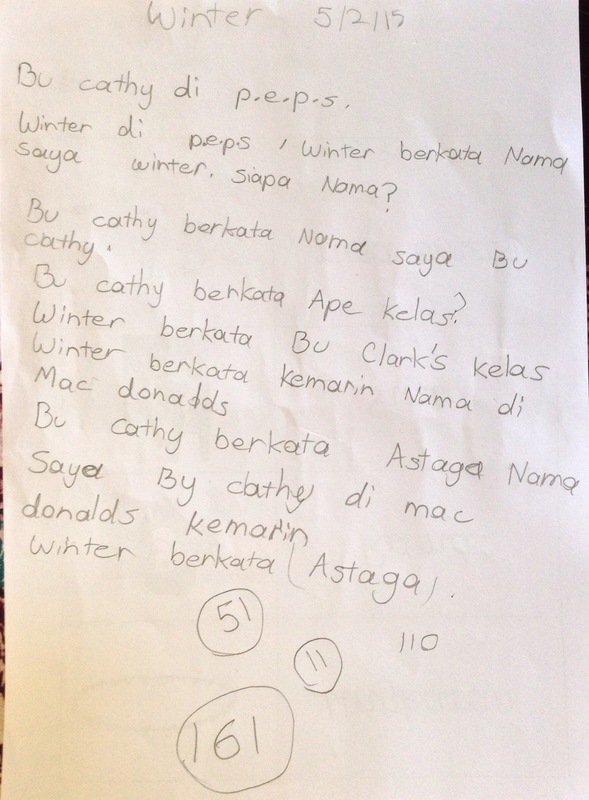 I read recently a post on Keith Toda’s blog, Todally Comprehensible about OWAT’s and while I agree OWAT is an activity for advanced students, I was still curious to see if my upper primary students could manage this. Last week was an extremely short week for us with Monday being a public holiday and Tuesday a student free day; so it seemed a perfect window to try OWAT with the 4 upper primary classes I taught. I printed the words off onto card, cut them out and then wrote on the back the translation. 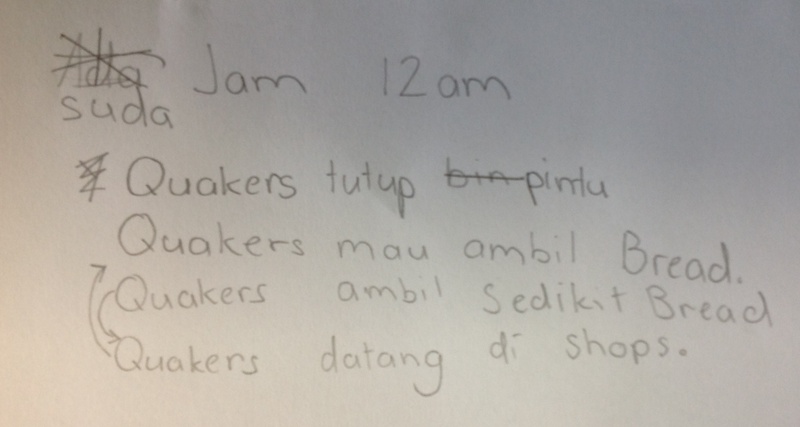 For the word ‘jam’ I also put it into 2 sentences to demonstrate how it can be used: What is the time? 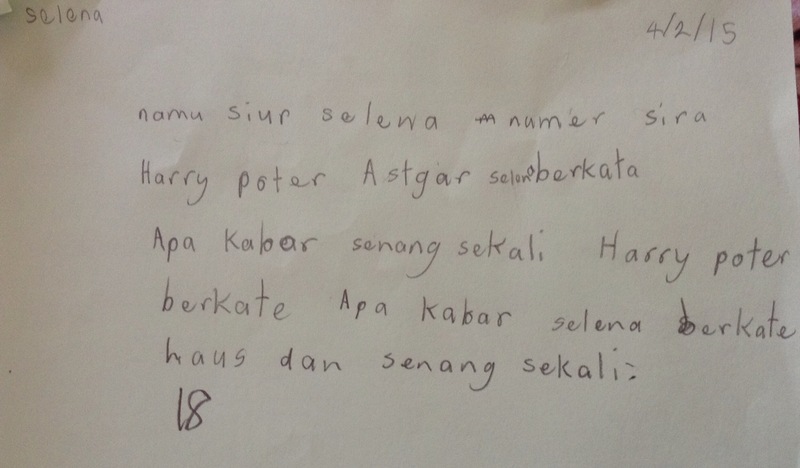 (Jam berapa?) & It is 2 oclock (Jam 2). On the back of the lucu card, I wrote funny (haha) to distinguish it from funny (strange) and in retrospect adding the words ‘haha’ was confusing and I should have just left it as ‘funny’ which was clear enough. I then laminated the cards but in future I don’t think that is totally necessary. 1. One student from each group comes to the front and chooses one card. Before looking at the back, check to see if anyone in your group knows the meaning. 2. Together as a team, create a sentence using that word. 4. If I like it and tell your group bagus sekali, then return your card and choose another. 5. Repeat with the next card and this time, the next sentence must follow on from the first to create a story. Do not write 10 unconnected sentences. When there were only about 5 minutes remaining of the time, I asked the students to finish the sentence they were working on and then write the resolution for the story. I collected them and then read them out to the class correcting any grammatical errors as I went. 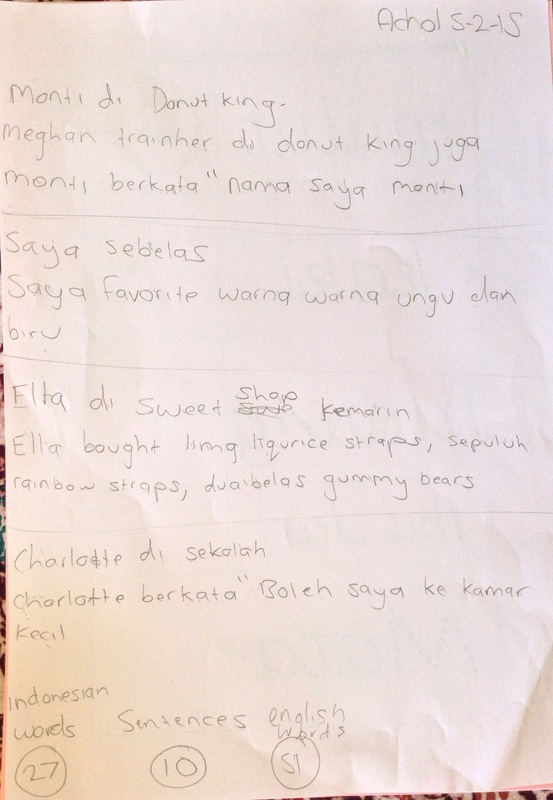 This was an extremely challenging exercise for my students and a few groups created stories they were truly proud of. 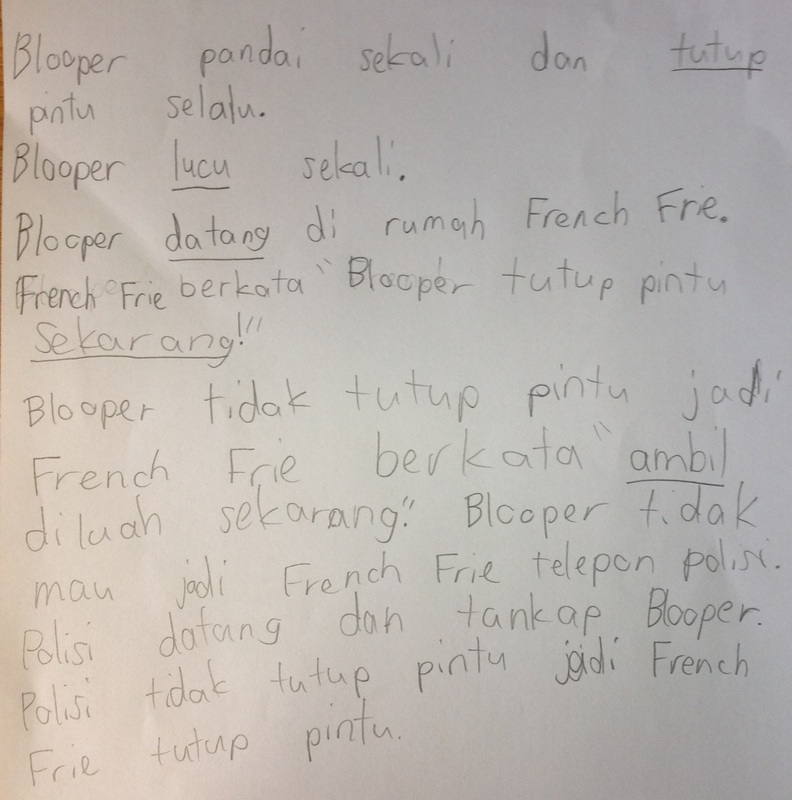 The groups had some fantastic discussions which must have included many repetitions of each new word because while I read the stories out, I added a few comprehension checks and students could confidently translate the new words. In contrast, the last lesson of the day was with a year 6/7 class who staggered into the Indonesian room and collapsed on the floor. They had come from PE where they had played dodge ball so they were very hot and exhausted! They begged to just lie down and do ‘relaxation like a reception class’!! 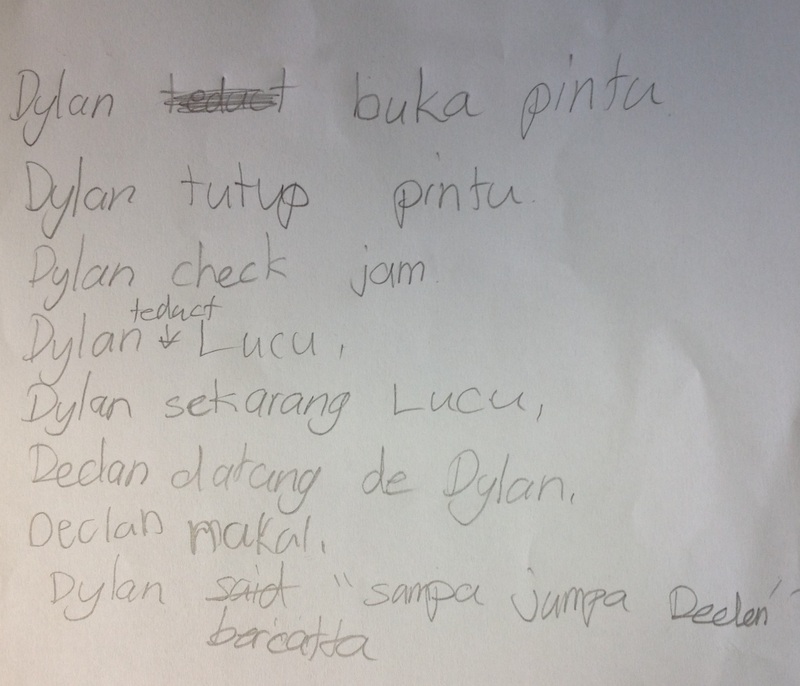 I explained the task and offered that we could do it as a whole class instead if they preferred. Of course they jumped at this. Together they created a funny story about Cody falling over at KFC. I would be interested now to see which classes learned (not yet aquired) the new words best; those that worked in small groups where the words were repeated many times or as a whole class where the words were held up, spoken by just a few and then put into sentences. In reflection it is clear I should have circled to address this however everyone (including me) was too hot and tired and maybe we should have all just enjoyed free reading time? Oh wel……. While very challenging, there is definitely merit to this exercise and I am wondering if students will improve and more groups will create even better stories next time. It is truly rigorous! I loved that students worked collaboratively to create sentences, because I feel it helped those students who find free writes (fluency writes) challenging. Sometimes during free writes, I have students sitting facing the word wall overwhelmed, so this hopefully gave them an opportunity to be involved in the process of creating sentences and or stories. I also believe that OWAT has postential for those of us in Australia struggling to create/design open ended assessment tasks that align with TPRS. The chosen words could be taken straight from the story just covered with students having the option to recreate the story exactly, recreate the story with a few added details or rewrite a totally new story. How do OWAT’s align with ACARA- The Australian Curriculum? 1.1 Socialising – Interacting orally and in writing to exchange ideas, opinions, experiences, thoughts and feelings and participating in planning, negotiating, deciding and taking action. 1.3 Creating – Engaging with imaginative experience by participating in, responding to and creating a range of texts such as stories, songs, drama and muisc. 1.4 Translating – Moving between languages and cultures orally and in writing, recognising different interpretations and explaining these to others. 2.1 – Systems of Langauage – Understanding language as a system, including sound, writing, grammatical and textual conventions. Can I tempt you with an idea about a great way to introduce new vocabulary with older students? Open this link to read Keith Toda’s blog post about OWAT’s and how he uses them in the Latin TPRS classroom. I think it could also be used to review vocabulary used recently! I’m looking forward to trying this idea with my upper primary students! Overall, the lessons ( see previous post) this week were awesome. I had a brilliant week and thoroughly enjoyed telling the story, ‘Pleased To Meet You’ with my middle and upper primary classes. 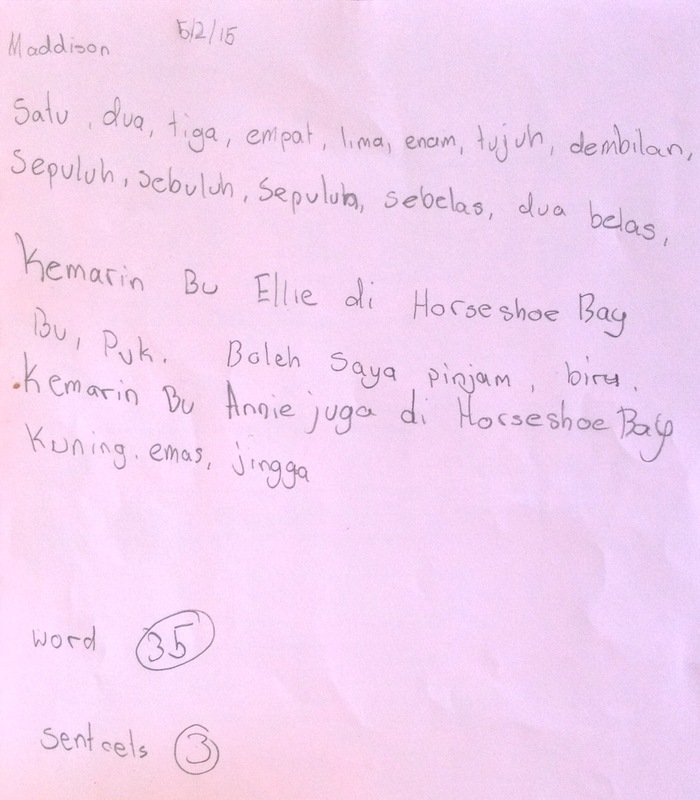 The junior primary classes though, focused purely on ‘nama saya’ and Siapa nama?’, so I could get photos of my reception students and also because unlike the older students, they only have one 50 minute lesson per week. As it was the same lesson repeated 8 times in all, I had to constantly remind myself to talk SLOWLY. While I was very comfortable with the story, students were encountering both the familiar and unfamiliar vocabulary for the first time ever in this context. The stop sign came up many times and that everyone joined in, made it easier for both the students to initiate it and for me to see it. Really helped me remember to go slowly and ask for comprehension checks. My 2015 timetable has worked out so well. I teach mostly middle primary classes on Monday which gives me the opportunity to iron out any potential kinks in it before facing the upper primary classes the following day. This week I was ready for them. I stayed upbeat and we all enjoyed a great lesson. So much so, that with the class before recess, when the bell rang, no one moved because we were mid way through acting out the story! They wanted to see it through to the final scene! Acting out the story was very popular and there were many volunteers. I tried to avoid choosing students who usually hog the limelight and gave the quieter students a chance to shine a la Ben Slavic advice. I introduced jobs this week during the first lesson with the upper prrimary classes mainly because I wanted to film each 6/7 lesson so that I had a record of the lesson. Had it gone haywire, I would be able to watch the video and pinpoint where I’d lost my students. I am also really curious to discover what I missed! So much happens with large classes, that I either miss things totally or suddenly realise that a student I believed to have been totally focused was successfully staying under my radar by timing his/her asides well. I haven’t had a chance to watch the films yet (partly because I am dreading watching myself in action/but mostly because I haven’t had the time!) but I did have a quick look at the photos. I had hoped to use the photos for lesson # 4 to help with retelling but unfortunately the photos were largely useless: out of focus and too far away from the action. The few that were in focus were not enough. Interesting assumption on my part that all older students know how to take photos with an ipad! -The look of panic on students faces when during the second lesson, I asked for the retell to be in Indonesian was in retrospect, to be expected. But once someone made a start, the panic evaporated and it all came together. I was delighted with how students collaborated to retell the story. -I had 2 visitors during this segment of my lesson; Marg, the year 5/6 teacher (who incorporates Indonesian phrases into her classroom day where ever possible) & Brenton, PEPS principal (& in a past life, was a Spanish teacher). I haven’t had a chance yet to ask for feedback, but I will…. -I have several year 6/7 students who rarely engage with my lessons. I successfully targeted 2 of them this week and gave them each an opportunity to shine while learning the importance of staying focused during lessons. Jesse rarely looks up, so during bola kenalkan, I firstly reminded everyone that they need to constantly watch. I then threw the ball to Jesse while he was looking downwards. He fumbled, grabbed it, responded and then returned the ball to me. After a few more students, I noticed that Jesse was once again not focused, so I gently threw the ball to him again. He looked up puzzled, returned the ball to me and said, “But I have already had the ball! !” To which I responded, “You need to watch ALL the time!” and pointed towards the expectations. 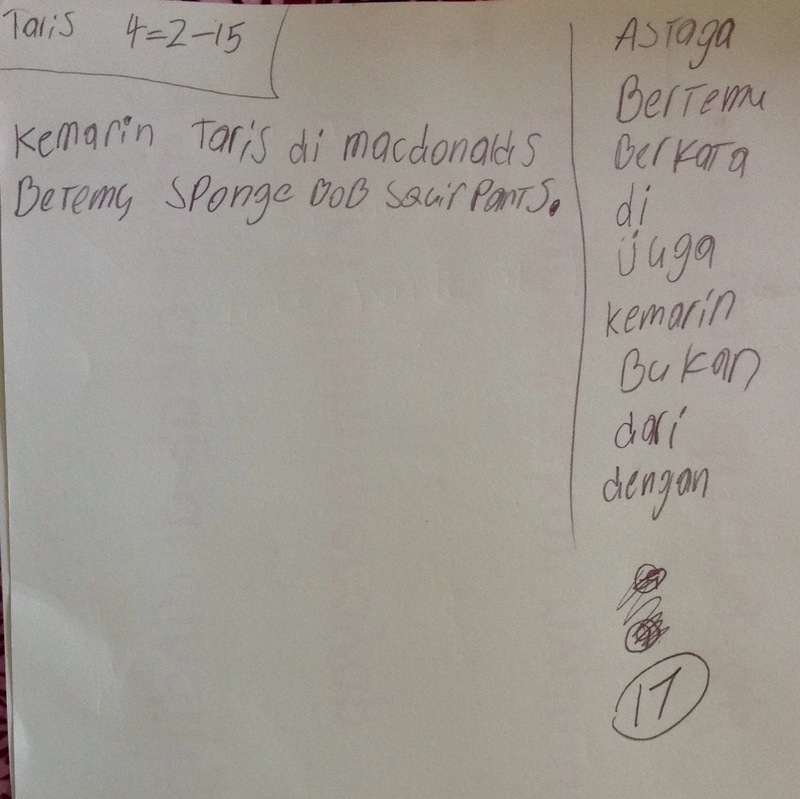 I returned it to him again and asked, “Siapa nama?” and this time he caught it and returned it answering my question. I then targeted other students and if I noticed Jesse was again unfocused, I again gently passed him the ball. He loved it!! It was so lovely to see a smile on his face as he reveled in the attention. The icing on the cake was when one of the sporty boys complained that it wasn’t fair, Jesse had had the ball 10 times and he’d only had it once!! -The other student, Drae, is one of those students who pretends he doesn’t understand so that he doesn’t have to contribute. I’m sure you all have one of those students. We had just started retelling the story and I asked him what came next. 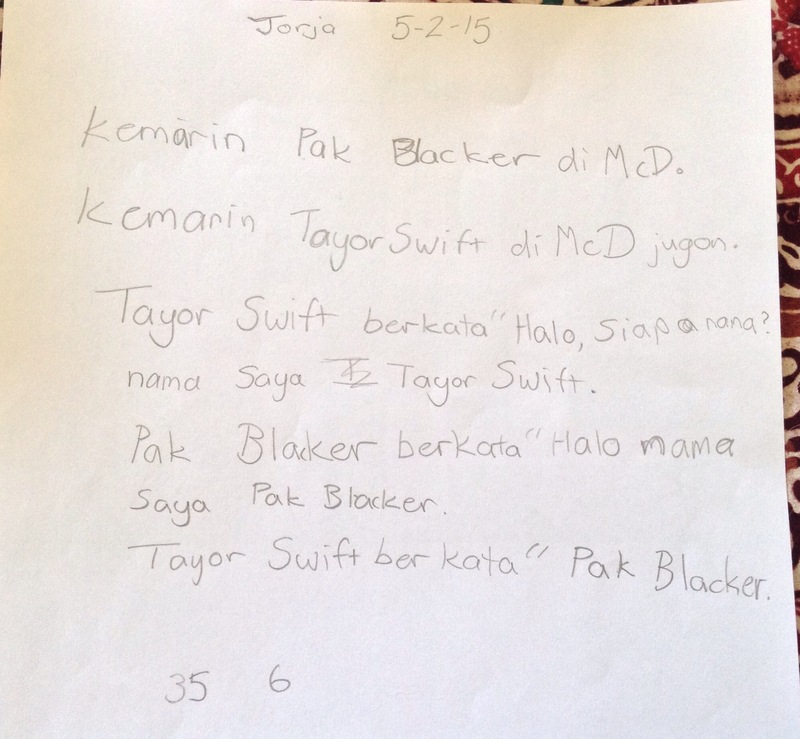 He baulked and stated he had no idea, so I asked him to translate what we had written so far. Again he baulked, so I reminded him about the stop signal. 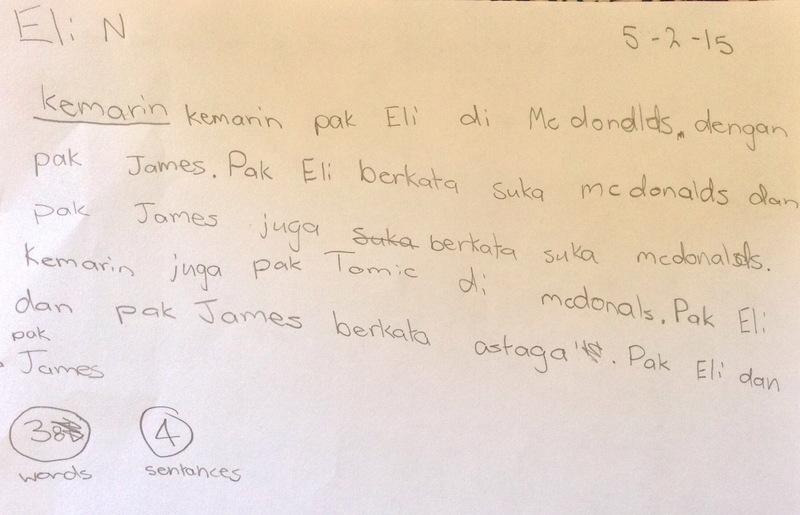 I then returned right back to bola kenalkan and passed him the ball, while asking, “Siapa nama?” Of course he could answer, so I did a comprehension check and naturally he could tell me what both sentences meant. So returning to the story, I again asked him to translate. Again he balked, so once again, I grabbed the ball and repeated the whole process. By this time, it finally dawned on him that there was no escape! He took a deep breath and proceeded to translate everything. The loveliest thing was that when he’d finished, the class erupted into a genuine and spontaneous applause! 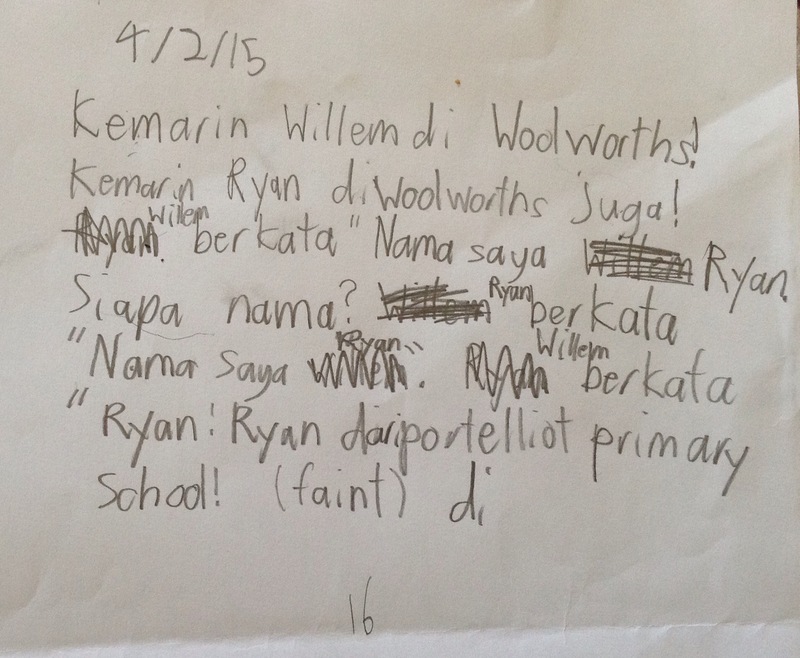 With impeccable timing, Brenton then entered the Indonesian classroom, so Drae received even more kudos! 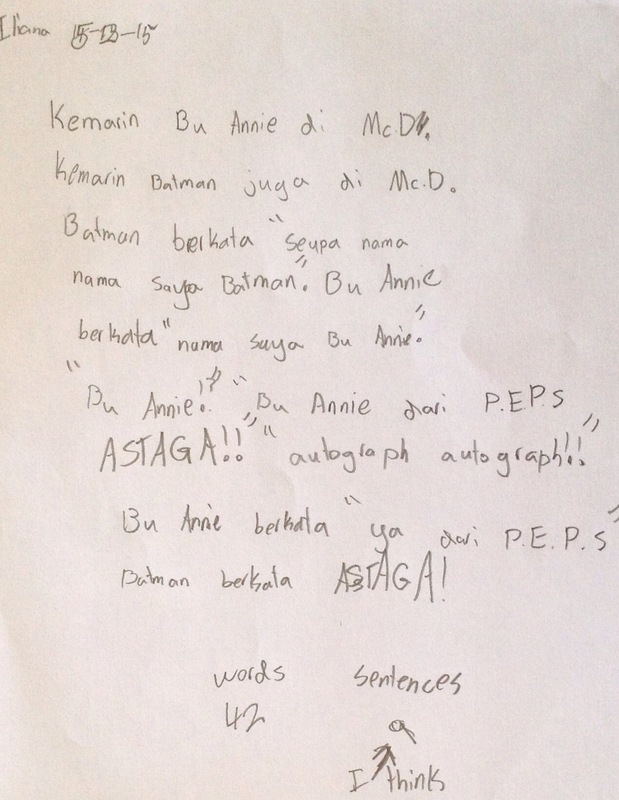 Since I started TPRS, I stopped both pronunciation and spelling instruction . This year, I didn’t say a single word about anything in Spanish– and I got the best spelling (and pronunciation) ever. If they hear/read it and they get it, their brains seem to soak up the rules and conventions. The same is broadly true of grammar. 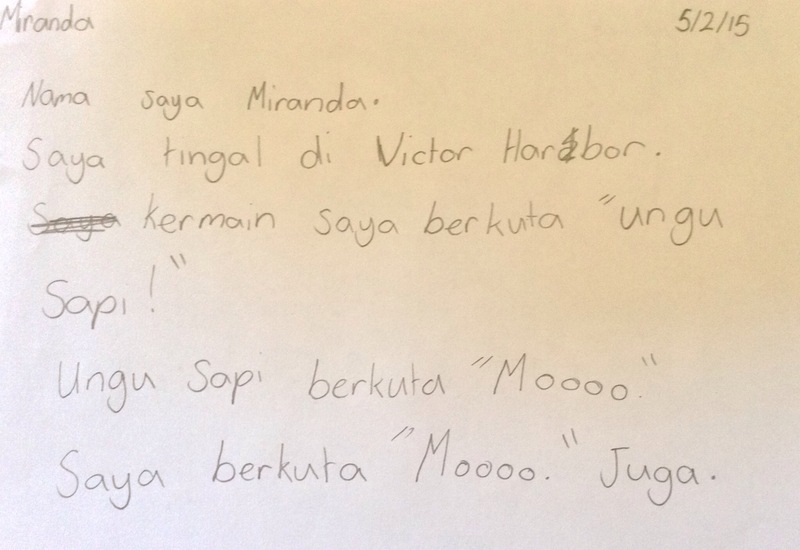 -I love the concept that students can write anything as long as it is in Indonesian and they understand it. It’s simplicity appealed to all students and is a great example of how TCI differentiates for all levels of ability and confidence. The more capable wrote stories while others were challenged finding words around the room they knew. I love the way the above student wrote a sentence structure and then focused on it! What great repetitions! 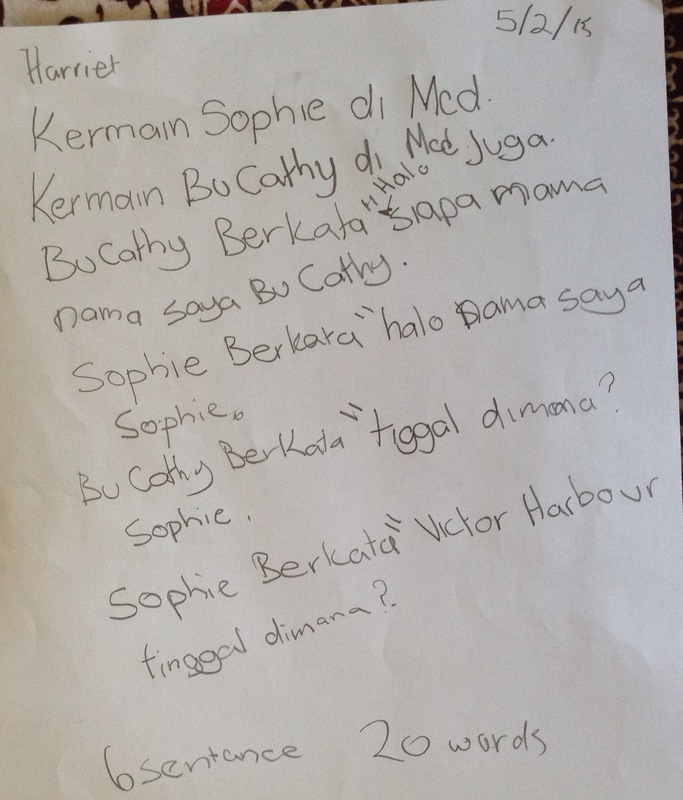 I love how Harriet incorporated kenalkan vocabulary from previous years into her story! Look how Illiana (above) added to the end of the story! Not an ending rewrite as such but a great example of what others could do too. Miranda also took the structure and built on it using vocabulary from previous years! How awesome! 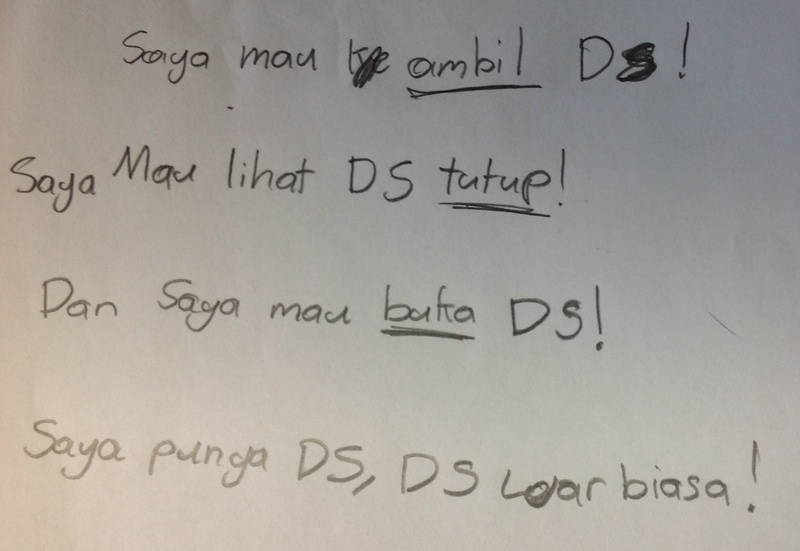 Look how Eli used dengan and suka!! Brilliant! Georgia has used the story structure to rewritte an entirely original story! In 5 minutes! Winter has used this opportunity to experiment with all the sentences and phrases she has learned over the primary years! How great is that!! 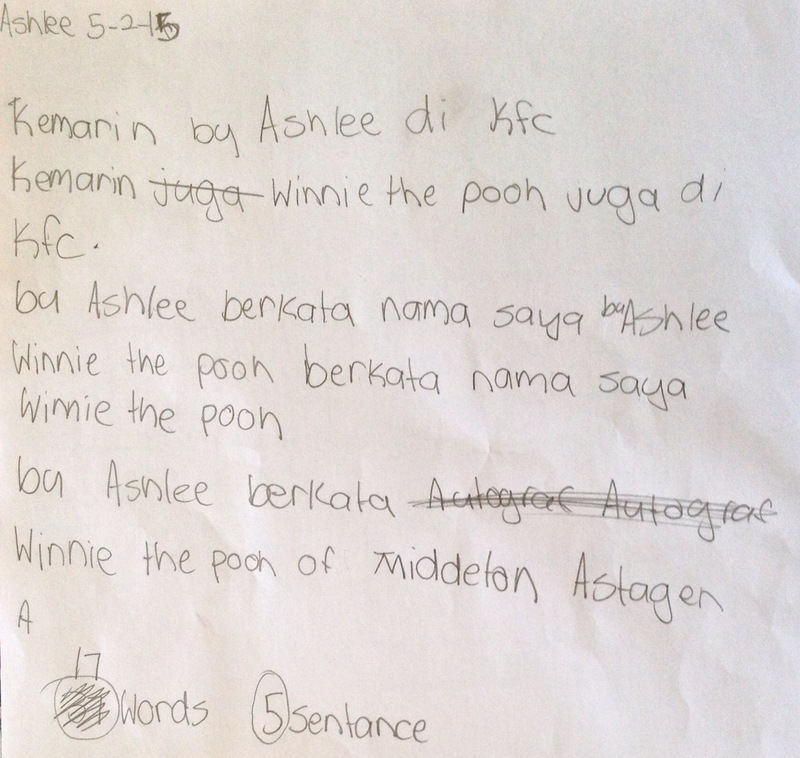 Look how the above student has spent the entire 5 minutes writing solidly!! Aren’t they amazing! Reading through them has given me an idea! How cool would it be to read them to classes and have students illustrate them as they are read??? The drawings then would make awesome ‘Look & Discuss’ pictures. I only read about L&D recently and this could be the springboard I need to give it a try!